As we've seen over the past 9 posts, there's a lot to dislike about milk. But it's not the only dairy product out there. In fact, the problem-causing proteins in milk can be found in a wide range of products from candy and chocolate, to flour and even skin care products. 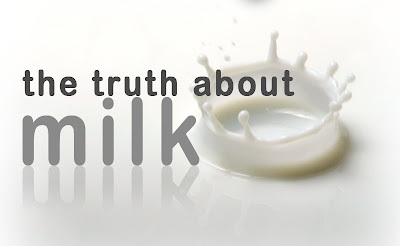 For this post, we'll focus primarily on the well known dairy products found on store shelves. At the end of the post, I'll go over some of the milk-derived ingredients to watch out for on other products. Cream is simply milk with some of the water removed. Normal milk is nearly 90 percent water, but heavy whipping cream is only about 60 percent water. Removing the water leaves the "solids" behind, the fats, proteins, etc. This means that cream is simply concentrated milk. All of the dangers of milk are increased when consuming cream. Other cream products, such as half-and-half, or light cream, simply have different amounts of water removed. Sour cream is slightly different in that it is produced by actually souring regular cream by using bacteria. The resulting product is then enhanced with sweeteners or flavorings. For a nice, official listing of the differences between various types of cream, click here (warning, PDF). Cheese is a product produced around the world, and for many thousands of years. It is also difficult to classify in a short paragraph like this because there are so many varieties of cheeses around the world. For this post, we are obviously discussing cheese made with cow's milk. There are many other cheeses available that use milk from goats, sheep, etc. Cheese is made by taking milk and curdling it to separate the fat from the liquid. View a detailed explanation on cheese production at Wikipedia. The important thing about cheese is that, like all dairy products, it still comes from milk. Anything in the milk fat is also present in cheese. Lactose is diminished in the cheese making process, but the milk proteins, growth hormones, etc. are all still present. The creation and use of butter dates back thousands of years. It is very easy to create and even easier to store. Butter is simply the fat from milk. Cream is agitated or churned, which causes the tiny fat globules to join together. The liquid portion is then drained off, leaving only the fat. By government regulations, butter must be at least 80% fat, though most butter is more. By only keeping the fat content, butter is considerably healthier than straight milk. And since it is un-homogenized, the fat globules are large enough to not pass through the intestinal wall into the bloodstream. However, butter is still dangerous. Firstly due to its fat and cholesterol content, which can lead to atherosclerosis. But also because animals use fat cells for storage. Vitamin D, for example, is a fat soluble vitamin, meaning that animals (including humans) can store vitamin D in fat cells. But many other chemicals that cows eat can be stored in fat. These include pesticides, growth hormones, etc. A number of milk proteins are also still present in butter. On the whole, butter is far healthier than milk. And, for the time being, it is the healthiest option for what we use it for. Margarine, the number 1 butter substitute available, is a very scary product that should be avoided. Olive oil can often be substituted for butter, especially in cooking. View a listing of various types of butter here (PDF). Live bacteria cultures are then added and given time to ferment before packaging. The bacteria cultures in milk can be beneficial to the digestive tract of humans, but yogurt itself is still mostly milk and has many of the same risks as milk itself. For digestive health, it is much healthier to take the bacteria cultures such as acidophilus in supplement form. Store-bought yogurt also has a number of chemicals and artificial ingredients, such as stabilizers, sweeteners, preservatives, etc. View a detailed article on how yogurt is produced here. As with cream itself, ice cream is basically concentrated milk that is frozen and mixed with sweeteners and flavorings. It is usually made from cow's milk cream, but can also be made from other creams as well, such as soy. We'll cover those in another post. And, just as with straight cream, ice cream has all the same risks and ingredients. These are the milk derived ingredients that are found in a surprising variety of foods. These ingredients are made with milk and almost always contain traces of the dangerous milk proteins we've been discussing for so long. The derivatives are often in very small quantities, but for a person with a severe milk allergy (or someone who wants to avoid as much dairy as possible for health reasons), these derivatives should be noted and steered clear of. View a listing of these ingredients here. This is a very, very brief and incomplete list. There are, of course, many other dairy products that I didn't cover, such as powdered milk, evaporated milk, coffee creamer, etc. It is safe to assume that all of these products contain milk or milk derived ingredients and should be avoided if possible. All of these dairy products can be researched separately, and I highly encourage you to do so. Wikipedia, for example has very detailed articles on each of these products, and while it's not a complete or definitive source, it's a good starting point.